“Black Art” is the only art there is. When we reflect on the idea of “black art” or “black magic” we must move beyond the oppressive imagery and mechanisms offered by a racist power structure. The thought that Black harms and White heals has permeated the fields of religious and spiritual study in the worse way. Black does represent negation and white represents addition but, this is neither “Good” or “Bad” but, rather, symbolizes choices of creation. We can add or subtract from the reality that we choose to create. Some things must go (Black) others' must be augmented (White). In classic definition the concepts of the Black Arts referred to a system or set of activities that perverted an orthodox system. For example, using biblical Scripture in order to invoke otherworldly entities was considered black arts. Interacting and approaching any thing that lied in the unseen, or dark, works would be considered black or dark arts. In truth art is created when an individual or energy decides to transform the original presentation or intention of a previously created object. That mangling or transforming, based on the perception of the creator, is what personalizes the art. That exclusive contract with ones own spirit is the only way that an individual can exhume their own personal art. By the standards of years gone by, this would be considered dark magic...or even witchcraft. Have you ever wondered why people put their heads in the sand when confronted with new data? There is still much post traumatic stress from the years of the inquisition. The idea of engaging in dark arts still carries a stigma cloaked in ignorant social ostracizing and blind religious fanaticism. If your art isn't “dark”, it's regurgitated information...plagiarism. Darkness is a corrupter but, spiritual darkness is the corrupter needed in order to spring forth with your own idea and voice. Soil vitiates and transformations sunlight. Once this begins the resulting product is unmatched by anything else on the planet. No two flowers are alike. Be not ashamed of your distinct cultural or ethnic influences. It is that seductive journey that your spirit embarks on through your flesh that allows you to manifest your mist unique voicing and power. 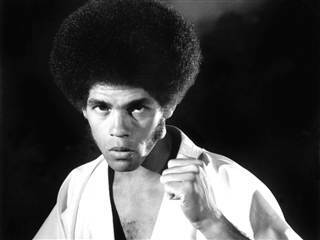 In this segment of Foundational Friday we celebrate the spirit of Jim Kelly, famed Martial Artist, Athlete, and Actor. Jim Kelly typified the concept of the Dark Arts.